FUNCTION BLOCKS and Small Power Supplies - Hybrid and Transistor. These are some of the Companies and Devices that were assembled before the advent of Integrated circuits. They were developed in response to the need for greater complexity and smaller size in industrial and scientific equipment. They enabled users to rapidly assemble and test units without the need to work entirely at component levels. This was the start of moving the detailed design away from the user and into the device manufacturer. 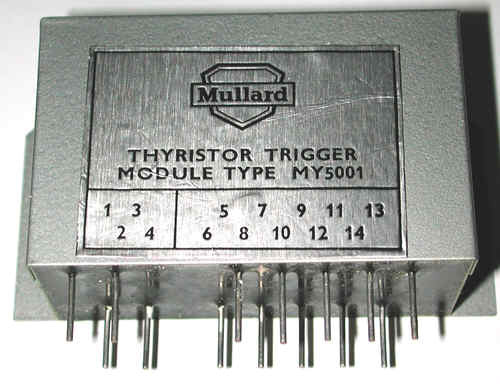 This was an important phase in electronic development: some companies such as Analog Devices, Burr-Brown, Mullard/Philips moved into integrated circuit design, fabrication and marketing. Others used the components in their own products which enabled growth in performance and markets - for example Micro Consultants with the novel A/D converters migrating into Quantel and the television signal processing areas. Typically operating from +15 volt supplies they were effective constructional blocks for signal processing and analogue computing. The modules listed below are those in my collection and are not intended to be a catalogue of all devices. Many of them still function. Others show signs of degradation of the encapsulating resin. In the table below "P" indicates a link to a picture, "D" a link to data. Cycon D to A CY2035 8 bit. Venner Modules for Counters and Timers.